They were toddler models and the cuteness overload is too much to handle. You'd be surprised how small the world of Disney stars really is. For example, Selena Gomez and Demi Lovato didn't meet each other in their Disney days. They actually appeared together on Barney as children. What many people might not know is that Raven-Symoné (That's So Raven/Raven's Home) and Ashley Tisdale (The Suite Life of Zack and Cody/High School Musical) have actually known each other for YEARS. No, we're not talking a decade or even two decades, guys. 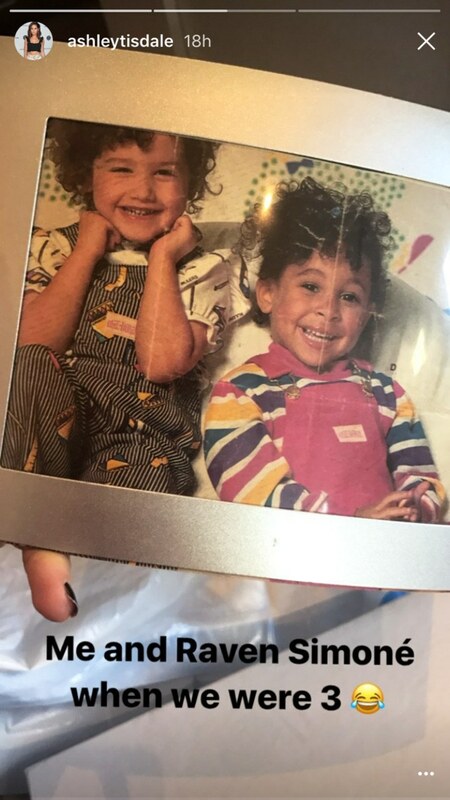 Ashley took to Instagram Stories to share a cute snap of her and Raven when they were toddlers and we cannot deal. Holy overalls! They were INCREDIBLY cute. Both ladies are 32 this year, which means that the 29-year-old modelling snap shows they've known each other for nearly three decades. The girls were signed to Ford Models way back when, so this must have been a very important overalls gig. Ashley and Raven were both child actors. Ashley starred in commercials and in theater as a child before landing on the Disney Channel. Similarly, Raven's big break came when she appeared as Olivia on The Cosby Show in the early 90s. Both went on to become huge Disney stars, establishing themselves during the network's golden age of sitcoms. Raven has since reprised her role as Raven Baxter on the Disney Channel and Ashley's throwback is a reminder of just how long both of them have been in the business. Our hearts cannot take it. What do we have to do to get them to recreate this iconic picture?